20' Wide x 51' Long x 8' High Combo/Utility Carport with our best A-Frame, Vertical Roof System. 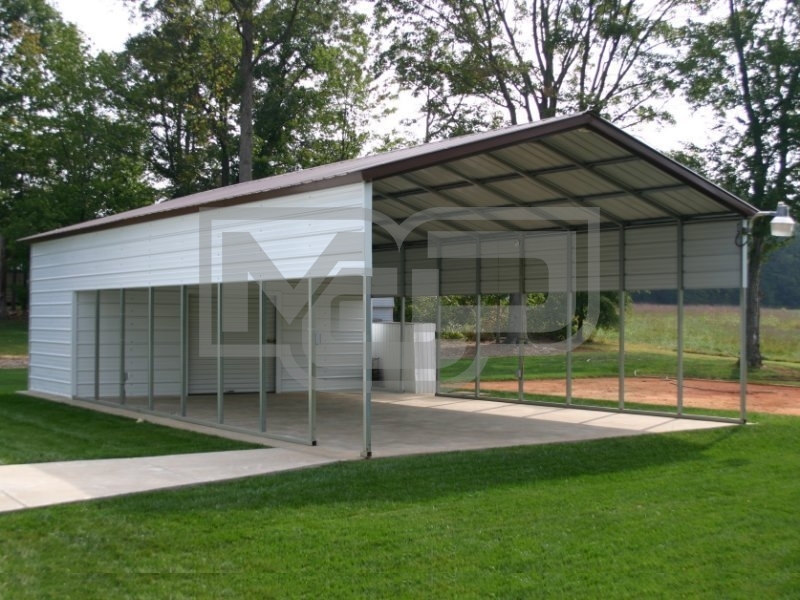 This unit consists of a double-wide carport shelter and a 20' wide x 10' deep storage room for enclosed, secure storage. It also features an 18" panel on each side wall for shade and gable end on the front for added shelter from the elements for your vehicles, as well as curb appeal. With all of our units, we can customize the shelter or storage area for your application. Certified Units ((Optional Upgrade) Mobile Home Anchors for Ground Installations. Expansion Sleeve Anchors on Concrete. With the many options that we offer, such as panels for the side wall, gables for the end wall, fully enclosed sides and ends, the unit can be customized for just about any use. As long as the unit is tall enough to accommodate garage doors, the A-Frame boxed eave double carport shelter can be have all walls closed to create a garage or workshop at any time. We can also a provided enclosed utility storage on the end of the carport or down the center of the double carport. If you have questions about other options and uses, just let us know and we will be happy to work with you to create a boxed eave double or 2-car carport or other unit that works best for you. We offer 13 colors from which to choose, 14 and 12 gauge galvanized framing, and non-certified and engineer certified, boxed eave double carports designed to meet local wind and snow load requirements. With so many options and features, we are confident that we can provide you with and unit that you will be pleased with for years to come. Metal Carports Direct is known for providing top quality, regular style double carports and 2-car metals carports at the best value. Our mission is to provide our customers all of the information that they need to make the most informed buying decision possible. Our team will work with you to determine your exact need and provide you with several options so that you can choose the best one that works for you. That is the easy part! Once we have all of the information that we need to build your boxed eave, double carport or 2-car metal carport, we will provide you with the exact cost of the unit, delivered and installed on your site. The only thing that we require is that you look over your order to ensure that we have every detail as you need it. If so, you will sign off on the order, pay a small down payment to get the order started, and we take care of the rest. It is really that easy! We look forward to serving you!